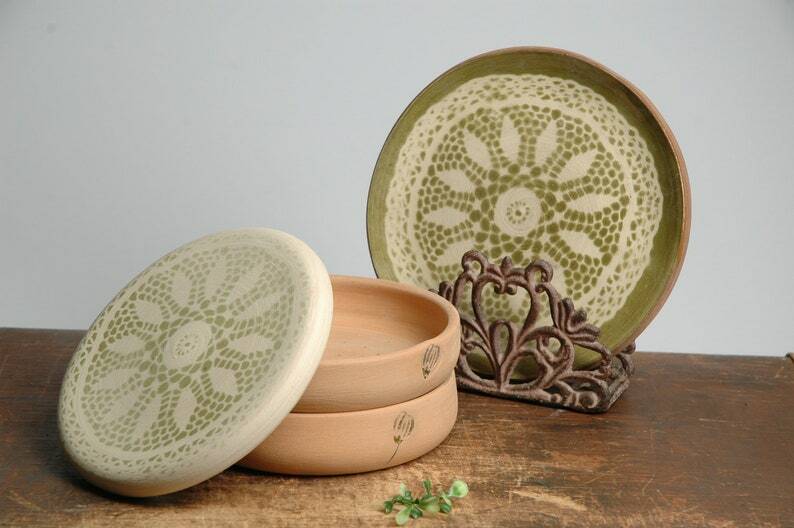 Color: terra-cotta (unglazed clay) with salad green lace print. Sprouting tray has holes on button, so you can wash sprouts under tap water. 2 trays are easy to use, if you are fond of sprouting and want to sprout different sprouts in one time. Conditions in the sprouter are very similar to the natural conditions in soil: pores in the clay sprouting dishes provide for good ventilation and the clay’s ability to absorb water assures uniform moisture without actually immersing the seeds in water. Thus, it can absorb 10% of its weight in water. The darkness inside the sprouter intensifies the flavor of the sprouts. If you prefer to eat watercress, alfalfa and other sprouts when they are green and rich in chlorophyll, simply open the lid and place the sprouter in the light a day or so before you plan to eat the sprouts. I do repeat these trays. So they can slightly differ from picture - may be lighter, more black, but pattern will be the same. I am using my grandma crochet blankets for patterns. Soak seeds in any bowl of water for 12 hours! Sprouting begins only when the seeds have absorbed a significant amount of water. Dry seeds contain only 5 to 12% water, but after soaking for a just a few hours they hold 70% water. Place sprouting dish in water for some minutes. This permits the porous clay of the bowl to absorb water, which later provides a good environment for sprouting. Place the washed seeds into it. Place the sprouting tray on dish and add some water on it. Put on the lid. And you’re done! The sprouts can be harvested as early as 3 to 4 days later. Imortant: wash seeds every day! It can be easy done through holes made in sprout dish. No need to remove seeds, just place it under tap water. Any questions, please ask! Sprouting is very easy - once you started, you will find plenty of seed variety to try! This is so beautiful. It's just the thing I was looking for, for my kitchen. Have received a lot of compliments on it. So pleased with this purchase. Thank you so much. I use this daily and am in love! I get compliments daily on how beautiful it is. It feels so smooth to drink from. Much better than the plastic travel mugs. It felt a bit rough when i received it but it smooths over time. I would hate to go without it now! A perfect present for any new parent or someone who commutes! I care about all my work, and I want you to care about it too. If you buy something from me and you find it’s not exactly how you wanted it, just return it and I’ll do refund. Customer have to pay for the shipping back and is responsible for packing and tracking code. I ll refund as soon as receive item back. It may take about 2 weeks depending on country. If something is broken, please send me a picture - we will resolve it together. I do refund immediately or send out new item for free. I ll ship in 3-5 days. If your item is "made to order", - i ll ship in one week. Usually delivery takes 12-14 days to Canada, USA , Australia or other none EU country. If you are located in Europe - it ll take about 7 working days. Unfortunately I can't affect on Posts service work if parcels are dalayed for some reason. I can only send out them on time and send you tracking code. For long delays, please, convoy - we will find resolution. Parcels never got lost! They all can be tracked. 1. you can wait until its finally arrives. If you don't need it any more, - you can send it back. I ll pay for back shipping and refund full sum of item. 2. You can wait until its arrives, but don't take out from post! Parcel will travel back to me, but it may take longer time! When it is back to my place, - i ll refund full sum. 3. you can be patience and wait until it arrives. And accept my apologies on Post or Custom work.